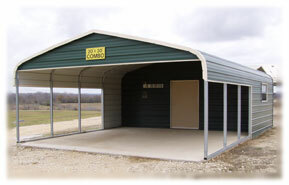 Versatile Steel Buildings manufactures and designs high quality steel buildings ideal for use as garages, shops, carports, cabins, sheds, greenhouses, farm houses and RV covers. Our pre-engineered Industrial tubular steel buildings are absolutely the finest fabricated on site buildings in design, quality and durability. Versatile Steel Buildings cost far less than conventional construction projects, and they are absolutely maintenance free. Get started on your metal building project today and see how Versatile Steel Buildings meets your building needs with outstanding product quality and unmatched service. Call 800-510-0243 for your free quote today. Painted galvanized 29 & 26 gauge Fabral® sheet metal in 17 attractive colors. Centrally located between Austin and San Antonio in McQueeney, Texas.